Strut is designed for group to communicate structural information regarding the form of an improvisation or prescribed composition. It is very suited to bound improvisation. As well as offering a basic playback of a score, the score can be altered while in use allowing compositional response to previously played material. 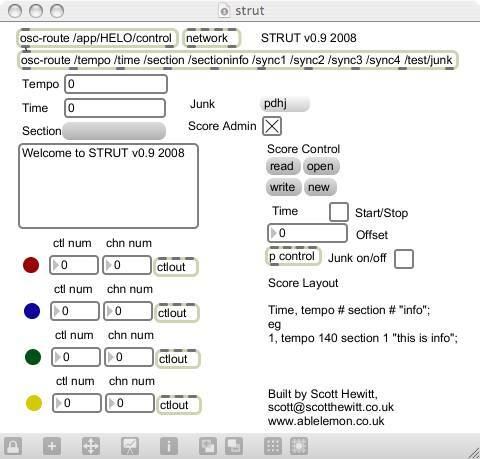 Strut is built within the Max/MSP environment and utilizes the Hewitt OSC NameSpace Syntax. It is network aware and allows you share a score dynamically across a network connection(udp port 7474). Strut shows you the current active tempo, time into performance and the section of the work. It will also pass limited relevant information regarding the section. Four sync points are made available for which can be connected to midi controllers if required. These sync points are not controlled by the score. Strut should only need loading to work. To enter admin mode click on the check box, all performer functions continue to work. Select to either read, write. open or start a new score. Strut plays text score which detail information at points in time ie. a Max patch here. (This download does not include Struts dependencies). an OS X application here.